Due to experiencing a Fibromyalgia flare, which has me in constant pain and fatigue, I haven't been able to get out to get any new photos this week. Not only does the flare affect me physically, but it is affecting me emotionally too, as I am very angry and frustrated with my body which will not allow me to properly function as I normally would. Oh well, enough of the whining. This is a photo of an Eastern Phoebe (if I'm correct in my identification). I think they are such pretty little birds. This one was nice enough to pause and pose for a portrait - Say that 10 times fast! if you get too close to those barbs! It's an adorable little bird! nice shot, the bird is so cute.. i like it..
Great shot, very sharp good catchlight in the eyes and a wonderful depth of field. I hope your pain is relieved soon - sounds really nasty. birds are so quick and difficult to capture, you did a fabulous job getting this little one to pose for you. Hi Misty, sure hope you feel better soon. I love your little bird. Enjoy the rest of your weekend in good health. What a lovely little bird. Thanks for sharing your photo, especially when you aren't feeling well! Beautiful shot of the Phoebe, Dawn! I hope you feel better soon. Wish you get better soon! SO sorry about your fibro-flare, Misty. I can sure empathize. I've had FM for a long time and have it more or less stabilized so I can function at half speed and with only a few muscle spasms amongst the generalized low-level pain. This may not sound so wonderful to people without chronic pain but it sure is an improvement in my case. Meanwhile, I love your Phoebe. It's the sort of bird that makes me squeak, "Oh, look, look, look, how can anything ever be so cute?" I figure if I can find joy in wildlife, little children, my dog's antics, and the people I love, I'm not so badly off as I sometimes feel I am. I enjoy birdwatching. And this cute little one is simply adorable! I Love that shot, ver crisp! Sorry to hear of your ailes. Really pray you can feel better soon. the nerves when you have bad aches. 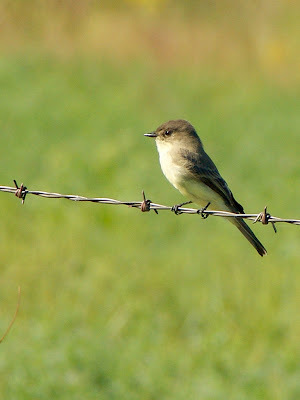 "Oregon's Wild Harvest"
Stunning picture of this cute little phoebe. Hope you get to feeling better soon. I know how rough FM can be. I hope your flare up ends soon. I know a couple people who have that. It's no fun. I just said a prayer for you. He's a cutie. Great shot! Oh Misty! you nailed him! Love! Hope my BBFF is feeling better! Want me to come down and take care of you? Wow, now that's a perfect shot!